There are several types of depositors that place a bakery product onto a pan or directly onto an oven bed for baking and other tempering operations. Depositors can be very specific as to definite shape and thickness or they can be more of a portion that is deposited from a product batch of premixed materials such as cookie dough and this id portioned out and deposited onto sheets or oven bands. These can also be specific shapes and patterns, which are formed from the respective mixtures and places on a band for baking. This is common with cracker or biscuit products. Semi-automatic, 36-piston depositor. Has 24"L x 8 1/2"W manifold, thirty-six 15ml pistons, 2" diameter sanitary flow-thru product connection, setpoints for major piston adjustments, hand crank for minor piston adjustments, 15" vertical adjustment for depositing head, foot pedal activation, production count reset, LED display, water pump, and quick connect water jacket hoses. Mounted on epoxy coated steel frame with casters and set down feet. Cookie depositor. Equipped with lugged infeed on 24"centers, 20"L x 12"W x 10"D product hopper, roller feed system, manifold die head and wire cut off. All stainless steel contact parts. Capable of handling a 17-1/2"W tray. 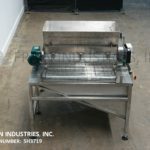 Automatic, inline, stainless steel, waterfall style topping applicator with pounds of product per hour – depending on materials and application. Fill Width: up to 28". Equipped with 26" long x 22" wide x 10" deep charge area with a 28" wide x 64" long blue belt through rotary product feeder with (6) sections of feeder fingers and 28" wide waterfall product dispenser with 42" ground clearance. Loos Machine, automatic, inline, stainless steel, waterfall style topping applicator with pounds of product per hour – depending on materials and application. Fill Width: up to 28". Equipped with 42" long x 26" wide x 10" deep charge area with a 28½" wide x 60" long blue belt through rotary product feeder with (5) sections of feeder fingers and 28" wide waterfall product dispenser with 39" ground clearance. Mounted on stainless steel base frame with casters and Weigh-Tronix load cells. Bulk material handling and dumper system tower style with 12′ discharge height. Equipped with 134"L x 48"D trough cage, and SS dough trough not shown in photos. Mounted on mild steel base. Stainless steel, 34" wide, rotary paddle sieve topper. Equipped with a 34" wide x 7" long x 14" deep trough with (12) paddle agitation powered by a hydraulic drive and bottom screen (change part per application). Unit mounted on stainless steel frame to be mounted above existing conveyor.